ISTANBUL — America’s top diplomat met on Tuesday with Saudi Arabia’s King Salman and his son Crown Prince Mohammed bin Salman over the disappearance and alleged slaying at the kingdom’s hands of Saudi writer Jamal Khashoggi at its consulate in Istanbul. Secretary of State Mike Pompeo smiled and shook hands with both men, who warmly greeted him just hours after a Turkish forensics team finished a search inside the Saudi Consulate, looking for evidence of the Washington Post columnist’s alleged killing and dismemberment. Police plan a second search at the Saudi consul’s home in Istanbul, a Turkish Foreign Ministry official said, where leaked surveillance footage show diplomatic cars traveled to shortly after Khashoggi’s disappearance on Oct. 2. Saudi officials previously have called Turkish allegations that the kingdom killed Khashoggi “baseless,” but reports in U.S. media on Tuesday suggested the Saudis may acknowledge the writer was killed at the consulate. Saudi Foreign Minister Adel al-Jubeir greeted Pompeo when he landed in Riyadh. The former CIA chief didn’t make any remarks to the media. 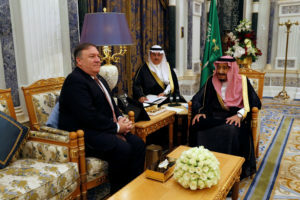 Soon after, Pompeo arrived at a royal palace, where he thanked King Salman “for accepting my visit on behalf of President (Donald) Trump” before the two went into a closed-door meeting. Pompeo then met a smiling Prince Mohammed, the 33-year-old heir apparent to the throne of the world’s largest oil exporter. Khashoggi fled Saudi Arabia and took up a self-imposed exile in the United States after the prince’s rise. Trump, who dispatched Pompeo to speak to the monarch over Khashoggi’s disappearance, said on Monday after talking with King Salman that the slaying could have been carried out by “rogue killers.” Trump provided no evidence but that statement potentially offers the U.S.-allied kingdom a possible path out of a global diplomatic firestorm. CNN reported that the Saudis were going to admit the killing happened but deny the king or crown prince had ordered it — which does not match what analysts and experts know about the kingdom’s inner workings. The New York Times reported that the Saudi royal court would suggest that an official within the kingdom’s intelligence services — a friend of Prince Mohammed — had carried out the killing. According to that reported claim, the crown prince had approved an interrogation or rendition of Khashoggi back to Saudi Arabia, but the intelligence official was tragically incompetent as he eagerly sought to prove himself. Both reports cited anonymous people said to be familiar with the Saudi plans. Saudi officials have been in and out of the building since Khashoggi’s disappearance without being stopped. Under the Vienna Convention, diplomatic posts are technically foreign soil that must be protected and respected by host countries. What evidence Turkish officials gathered at the consulate remains unknown, though Erdogan told journalists on Tuesday that police sought traces of “toxic” materials and suggested parts of the consulate had been recently painted, without elaborating. On Tuesday, a Turkish Foreign Ministry official acknowledged police want to search the Saudi consul’s home as well. The official, who spoke on condition of anonymity in line with government regulations, gave no timeline for the search. Khashoggi has written extensively for the Post about Saudi Arabia, criticizing its war in Yemen, its recent diplomatic spat with Canada and its arrest of women’s rights activists after the lifting of a driving ban for women. Those policies are all seen as initiatives of Prince Mohammed, the son of King Salman, who is next in line to the throne. Prince Mohammed has aggressively pitched the kingdom as a destination for foreign investment. But Khashoggi’s disappearance has led several business leaders and media outlets to back out of the upcoming investment conference in Riyadh. Trump’s warning drew an angry response Sunday from Saudi Arabia and its state-linked media, including a suggestion that Riyadh could wield its oil production as a weapon. The U.S. president has been after King Salman and OPEC to boost production for weeks to drive down high crude oil prices, caused in part by the coming re-imposition of oil sanctions on Iran after the U.S. withdrawal from that’s country’s nuclear deal with world powers.